The chief executive of Maricann Group Inc. is taking aim at the underwriters who terminated a recent financing. The chief executive of Maricann Group Inc. is taking aim at the underwriters who terminated a recent financing, alleging that least one of them worked to kill the deal for their own benefit and that of short-sellers who were betting against the marijuana grower's stock price. In late January, Maricann announced a bought deal to raise at least $70-million, with Eight Capital and Canaccord Genuity Corp. serving as the lead investment banks. They each had agreed to buy 40 per cent of the deal from Maricann and then resell those securities to other investors. Last week, the syndicate of underwriters, which also included GMP Securities, Industrial Alliance Securities and Clarus Securities, formally cancelled the deal after The Globe and Mail reported that Maricann hadn't disclosed an investigation by the Ontario Securities Commission (OSC) into CEO Ben Ward. The commission has also made inquiries into recent trading by company directors – two of whom resigned after The Globe's report. In an interview published on website Stockhouse.com, Mr. Ward alleges that an unnamed underwriter sought to tank the deal because pot stocks tumbled shortly after the financing was launched. "One of the underwriters likely didn't have the capital to execute on our financing if its clients pulled their orders," he alleged in the interview, published online on March 6. "We believe the underwriter in question was working with clients that shorted our stock in the wake of the deal collapsing with the intention of destroying Maricann's shareholder value and making off like bandits at the same time." "There was clearly something nefarious afoot," Mr. Ward said in the interview, which was done by Marc Davis, editor of a cannabis website. Mr. Ward goes on to claim that before the offering was to close, an underwriter publicly leaked inquiries from the OSC about matters involving Maricann, because the underwriters "likely thought they could create an environment of opinion in the market that would kill the deal, while at the same time destroying Maricann's shareholder value." In his interview, Mr. Ward also took issue with a series of articles published in The Globe and Mail, calling one front-page story "a clear hit piece." Mr. Ward did not provide any evidence to support the allegations made in his interview. He said Maricann was "considering pursuing legal action." Mr. Ward did not reply to a list of questions sent by The Globe on Thursday. A spokeswoman for Canaccord declined to comment. None of the other four investment dealers immediately responded to requests for comment. When first contacted by The Globe on Thursday, Maricann spokesman Graham Farrell wrote in an e-mail that the company "cannot comment due to OSC rules around the waiting period for our special warrants prospectus," related to a $40-million private-placement financing in January that has yet to close. When it was pointed out that those rules hadn't stopped Mr. Ward from speaking out, Mr. Farrell responded: "The statements in the interview were not authorized by the Corporation and represent the personal views and opinions of Mr. Ward solely." On Feb. 28, Maricann chairman Neil Tabatznik and director Raymond Stone resigned after it became public that the OSC had inquired about Maricann shares they sold in late January – just days before the company announced its stock offering. The combined share sales were worth about $8-million. In the same news release announcing those resignations, Maricann confirmed that Mr. Ward is the subject of an OSC investigation into his activities at Canadian Cannabis Corp., where he served as CEO prior to leading Maricann. It is unclear what the OSC is specifically investigating, or whether any of the underwriters were aware of the probe at the time of the financing's announcement. 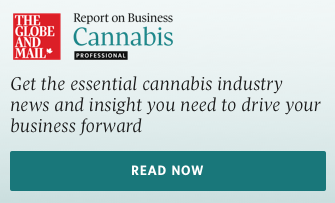 However, there is a connection between lead underwriter Eight Capital and Canadian Cannabis. Before joining Eight, head of equities John Esteireiro served as chief operating officer at Canadian Cannabis under Mr. Ward's leadership. Eight Capital did not reply Thursday to questions about the ties between Mr. Esteireiro and Mr. Ward. In the interview, Mr. Ward also alleged that one of these Bay Street investment banks may have had ulterior motives and possibly worked to damage Maricann's stock price so that a rival cannabis company could acquire it for a cheaper price. "In this regard, there was collusion on the part of this underwriter as far as I'm concerned," Mr. Ward said. "We are going to hold accountable to the full extent of the law any party that was acting in bad faith." According to a copy of the underwriting agreement signed by Maricann, the investment banks could have terminated the offering without penalty if it came to light that a securities commission is looking into the company or its officers or directors over any alleged wrongdoing that could harm the business. During the first trading session after the OSC's inquiries became public, shares of Maricann fell 22 per cent to $1.97. The stock has since recovered those losses, closing Thursday at $2.70. That is still well below the selling price per unit in the $70-million bought deal, which was $4 apiece.